It's no secret I have a few picky eaters in my house, I'm always looking for new foods for my family to try and it's always exciting when we find one that every single person loves! It doesn't happen very often but I had a feeling when my Ines Rosales package arrived that these foods would be a big hit! Thanks to Ines Rosales, I received a delicious package of Ines Rosales products for my family to try and enjoy! I was really excited to try the Tortas, they are a flat circular scone-like biscuit. They are the perfect mix of salty and sweet and are made with natural ingredients! Ines Rosales was founded in 1910 by Doña Inés Rosales Cabello. She began making olive oil tortas by hand and selling them at a train station in Seville, Spain. Using only local ingredients, including extra virgin olive oil and unbleached wheat flour, the demand for these crisp treats quickly grew, and became popular throughout Spain. Today Ines Rosales Tortas are still made by hand using the same recipe that was created over a hundred years ago. You will find five delicious varieties of Tortas including - Cinnamon Tortas, Original Tortas, Seville Orange Tortas, Rosemary & Thyme Tortas, and Sesame & Sea Salt Torats. Other products produced by Ines Rosales include the Cinnamon Cookie and Citrus Crumble Cake. You will probably have to resist eating the entire package at once, seriously, these are amazing! I've never tried Tortas before and man have I been missing out! The Seville Orange Sweet Olive Oil Tortas are hands down my favorite! They are made with crystallized Seville oranges and sprinkled with sugar, they will be sure to satisfy your sweet tooth! The Cinnamon Sweet Olive Oil Tortas would also be great as a dessert or breakfast treat! They are light, crisp and sweet, every bite is full of cinnamon! The Original Torta and Rosemary & Thyme Savory Oil Tortas are full of flavor and natural ingredients, these would be perfect with tea or paired with cheese! My children couldn't get enough of the Cinnamon Cookie or the Tortita Nevada, these round cookies are the perfect sweet treat - they loved them! The Citrus Crumble Cake or Cortadillo hits the spot for me, it's a mouth-watering double layer pastry with cinnamon, lemon and citron and pumpkin filling. After a long day, a bowl of vanilla ice cream topped with a Citrus Crumble Cake is exactly what I need! Overall we are very pleased with all of the Ines Rosales foods, they quickly became a favorite in our household and I can't wait to share them with my family and friends! So what do you think? Are you ready to try Ines Rosales products for yourself? Connect: Be sure to stay connected with Ines Rosales on Facebook and Twitter! 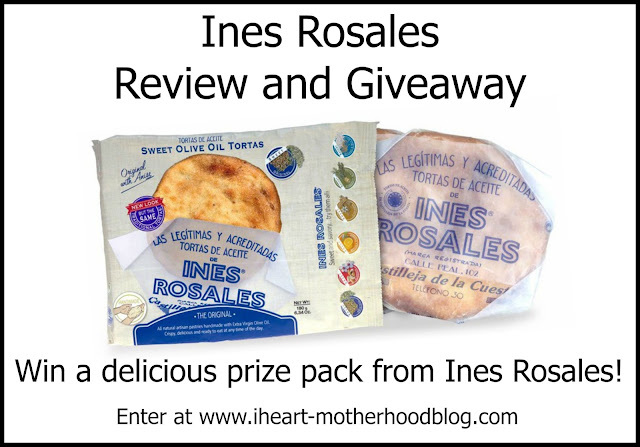 Buy it: Keep an eye out for Ines Rosales foods at your local store! I'd love to try the Seville Orange Tortas. These sound delicious! Thank you for the review and giveaway! The Cinnamon Tortas sound amazing! The Citrus Crumble Cake sounds good. I really want to try the Cinnamon Cookie. I would enjoy trying the Citrus Crumble Cake first.